Are you on having a holiday in one of Africa’s best safari destinations; Tanzania and you are still wondering how you can make this holiday exciting! Well, here is a sure way to have a day adventure in Tanzania on your Tanzania trip. Let your Tanzania safari itinerary include the Tanzip Zipline adventure! Tanzania has lots of thrilling adventure activties that offer breathtaking views, an adrenaline rush to the persons taking it, but also a lasting memory. The best thing about the Tanzip Zipline activity, is that it requires no prior experience! 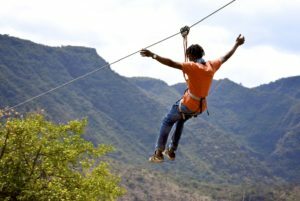 The Tanzip Zipline Adventure Park is located along the Northern circuit safari route, just minutes off the main road that leads to the national parks; Tarangire National Park, Lake Manyara National Park, Ngorongoro conservation crater and Serengeti National Park. For easy location, it is just outside of Mto wa Mbu village in Tanzania. It is nestled at the base of the great rift valley wall, offering you stunning views of surrounding lakes, wetlands, the Maasai plain, and the rift valley. This Tanzip Zipline is an exceptional eco-course that will offer you over 4 thrilling zips covering a total of over 1km, and 6 unique platforms built around majestic baobab trees. As part of your adventure, you will enjoy four thrilling jumps, a tree top view point, a suspension bridge, and a tree house bar! This Tanzip Zipline experience provides a few hours of fresh air, nature, walking, scenic views, and an exciting ride on the zip cable! 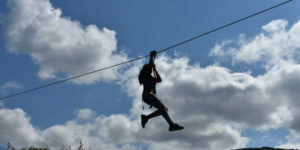 Before your Zipline adventure in this park, you will enjoy the safety orientation or tour briefing about the rules to follow, how you will use the cable, ropes and many more as you carry out the activity. After the briefing, you will be set off with an open-air ride in the Tanzip truck that will take you through the Maasai Land to the Tanzip Zipline Adventure park. Once your adventure safari is complete, you will be driven back to the Tanzip office where you will be given chance to view photos of your tour, and relax with a cold or hot bevy in the Tanzip cafe. You can also visit the Mto wa Mbu village tour, do a Maasai cultural tour in Tanzania, hiking safari Tanzania, or biking in the area after your zipline experience alone. You can add a short Uganda wildlife safari to your itinerary, a Rwanda wildlife safari, a Kenya safari tour, a Uganda gorilla trekking safari and many more interesting Africa safaris depending on your choice.